Light Probes Probe-based lighting interpolation mode. Reflection Probes If enabled and reflection probes are present in the Scene, a reflection Texture is picked for this GameObject and set as a built-in Shader uniform variable. Off Reflection probes are disabled, skybox will be used for reflection. Simple Reflection probes are enabled, but no blending will occur between probes when there are two overlapping volumes. Receive Shadows Tick this checkbox to make the Mesh display any shadows that are cast upon it. 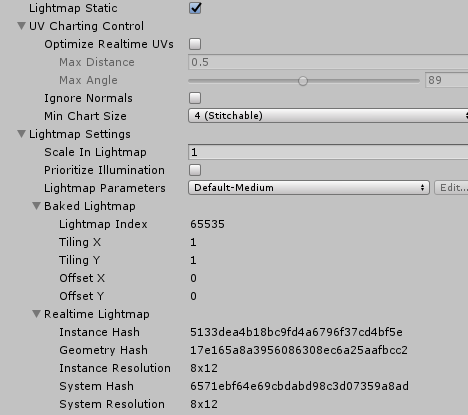 Lightmap Static Tick this checkbox to indicate to Unity that the object’s location is fixed and it will participate in Global Illumination computations. 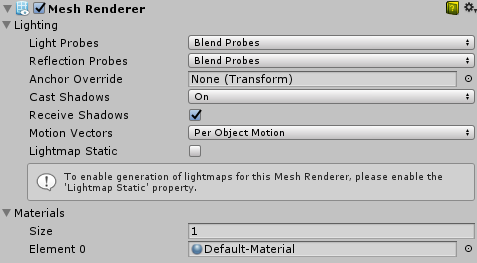 If an object is not marked as Lightmap Static then it can still be lit using Light Probes. Materials A list of Materials to render the model with. Meshes imported from 3D packages can use multiple Materials. All the Materials used by a Mesh Renderer are held in the Materials list. Each sub-Mesh uses one Material from the Materials list. If there are more Materials assigned to the Mesh Renderer than there are sub-Meshes in the Mesh, the first sub-Mesh is rendered with each of the remaining Materials, one on top of the next. This allows you to set up multi-pass rendering on that sub-Mesh - but note that this can impact the performance at run time. Also note that fully opaque Materials, simply overwrite the previous layers, causing a decrease in performance with no advantage. A Mesh can receive light from the Light Probe system and reflections from the Reflection Probe system depending on the settings of the Use Light Probes and Use Reflection Probes options. For both types of probe, a single point is used as the Mesh’s notional position probe interpolation. By default, this is the centre of the Mesh’s bounding box, but you can change this by dragging a Transform to the Anchor Override property (the Anchor Override affects both types of probe). It may be useful to set the anchor in cases where a GameObject contains two adjoining Meshes; since each Mesh has a separate bounding box, the two are lit discontinuously at the join by default. However, if you set both Meshes to use the same anchor point, then they are consistently lit. By default, a probe-lit Renderer receives lighting from a single Light Probe that is interpolated from the surrounding Light Probes in the Scene. Because of this, GameObjects have constant ambient lighting across the surface. It has a rotational gradient because it is using spherical harmonics, but it lacks a spatial gradient. This is more noticeable on larger objects or Particle Systems. The lighting across the GameObject matches the lighting at the anchor point, and if the GameObject straddles a lighting gradient, parts of the GameObject look incorrect. To alleviate this behavior, set the Light Probes property to Use Proxy Volume, with an additional Light Probe Proxy Volume component. This generates a 3D grid of interpolated Light Probes inside a bounding volume where the resolution of the grid can be user-specified. The spherical harmonics coefficients of the interpolated Light Probes are updated into 3D Textures, which are sampled at render time to compute the contribution to the diffuse ambient lighting. This adds a spatial gradient to probe-lit GameObjects.